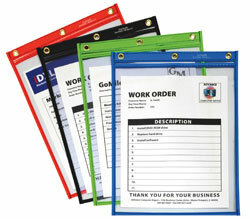 Neon Stitched Shop Ticket Holders let you color code important paperwork and make special jobs stand out. Convenient 10-pack. Works great for organizing work by department, day-of-week or importance. Sturdy, clear vinyl construction allows for easy visibility of documents and stitched seams ensure long-lasting utility. Convenient eyelet for hanging. Assortment includes 2 each: red, yellow, green, blue and orange. 10/PK. Learn about the wide variety of shop ticket holders at C-Line..
Hi, I'm Nicola at C-Line, and today we're going to talk about our Neon Stitched Shop Ticket Holders. One of the best features of this holder is the bright neon edges that help make special jobs stand out. Use color to organize important information by day of week, customer, and any way you choose. Taped and stitched edges provide extra durability for your documents. Store up to 9 x 12 inserts. Clear on both sides. The holder has a metal eyelet, making it possible to hang and post information anywhere you need it. This Shop Ticket Holder is perfect for a number of uses in manufacturing, auto repair, inventory control, office, retail, and shop environments. Order yours now! That's all the time we have for today. I'm Nicola at C-Line, thanks for watching.